Wig Wand-Eliminates Shine! A must for anyone who wears modacrylic wigs! Simply run the wand over any areas of the wig, which appear to have more than desired shine. 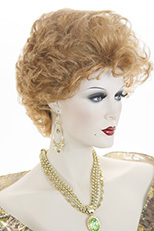 Makes any synthetic, modacrylic fiber wig look more natural. 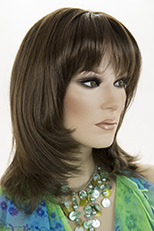 Stunning mid length, straight, shag style wig! Featuring a partial monofilament hand tied top, which is 4X5 inches is size. See item details for available colors. Beard five point. Hand tied. 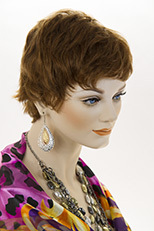 Sophisticated, short, layered, wavy, human hair wig with a natural looking skin top. This lovely style is fuller on the top and tapers at the nape. Natural looking shades of blonde, brown, red and brunette. See item details, for available colors. 100 percent premium human hair wig! Featuring a hand tied, monofilament top, for a completely natural looking appearance. Style it as you like, just as you would your own hair! Wear the hair flipped up, or just waved with your curling iron. See item details for available colors. Chic, short, layered, classic pixie style wig with longer layers on top and a tapered back. Perfect for any occasion! See item details for available colors. Modern, short, straight, chic hairstyle! This lovely short, straight wig is so natural looking! Rich shades of blonde, red, brown and black. See item details for available colors. Short to mid length, straight, chic, youthful razor cut wig. Featuring, a natural looking, monofilament hand tied top, which is 6 X 6 inches in size. The hair is razor cut framing the face with bangs. The hair length is from 8 to 14 inches. The bangs are 5 1/2 inches in length. See item details for available colors. 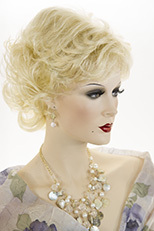 This chic short wig features a monofilament front, which is 4 inches by 3 inches in size. 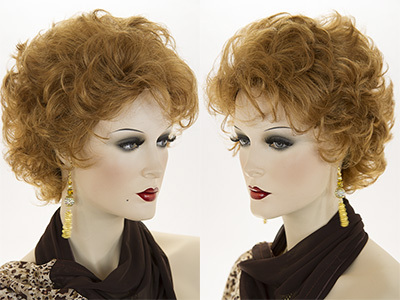 This lovely wig has a tapered back with lots of layers and body. For the most natural looking appearance, a monofilament wig cap construction is the ideal choice. Featuring the illusion of skin where the hair is parted, they are virtually undetectable to both the wearer and others. See item details for available colors. Glamorous, Long, luxurious, premium quality human hair, wig! Featuring, a natural looking, off center side skin part, with long side swept bangs. Hair is 20 inches in length with 6.5 inch long bangs. See item details for available colors. Charming and feminine! Long braid on one one side with soft side swept part. The hair falls to the mid chest. Perfect for theater costume or period look. See item details for available colors. Natural looking and glamorous! 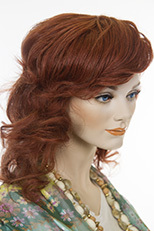 This stunning Mid length wig comes in rich shades of blonde, red and brunette. See more info for available colors. Mid length, wavy, textured bob style, with long side swept bangs. The bangs are approximately 7 inches in length. Featuring premium quality, Brazilian Remy hair, which is layered from 12, 14 to 16 inches in length. See item details for available colors. An empowered blend of pert practicality and sultry layers, this stunning short shag provides all-day beauty and cool comfort with O’solite open cap construction.